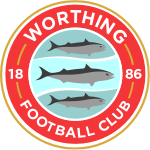 Both teams battled against the elements at a rather breezy Bibby but, it was Worthing who coped best with the conditions to come out on top and leave Whitehawk still looking nervously over their shoulders. Forced and tactical changes saw Ollie Pearce reclaim the number ten shirt from the suspended Alex Parsons and Ross Edwards come in for Joe Clarke, while Billy Barker was back amongst the replacements. 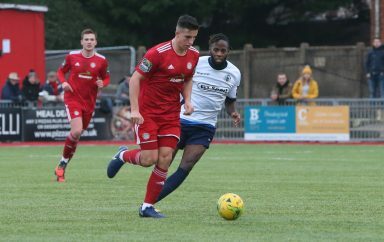 The first chance of the afternoon produced the first goal, as Yannis Ambroisine tussled with Callum Kealy, marginally inside the penalty area but it was the visiting defender who was penalised, as the referee pointed to the spot. Once the protestations had died down, David Ajiboye stepped up to emphatically power home, despite Melvin Minter going the right way. Minutes later and Kealy was involved again, when he was the recipient of Ricky Aguiar’s long ball forward, that had been missed by Ambroisine’s swipe at it and laid off to his left, where Pearce was on hand to side-foot an effort that Minter easily saved and, despite the ball spinning back from Fin Walsh’s clearance for Pearce to slot through the ‘keeper’s legs, it had already gone out of play. The subsequent set-piece was headed over by Alfie Young. 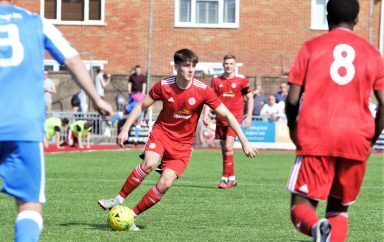 Whitehawk then created their opening opportunity of the contest, which started with Aaron Goode doing well to keep the ball in on the left and find Nat Pinney in the box. He held off the close attentions of Jalen Jones, who did well to deflect Lucas Rodrigues’ drive over the bar. A counter-attacking move almost lead to a second goal for the hosts, when Pearce headed a left wing corner clear and Kwame Adubofour-Poku sent David Ajiboye racing away, after his lovely touch and turn had bamboozled Rhyle Ovenden. The Nippy Nigerian spotted Pearce to his left but his low delivery across the area to Kwame was cut out by former Red, Ovenden. Pearce drifted inside off the left flank and fired in a shot that was parried by Minter, with Ovenden denying Kwame a second bite at the cherry, before Jesse Starkey performed a similar routine, only this time, he elected to tee-up Ajiboye, who shanked his effort well wide. 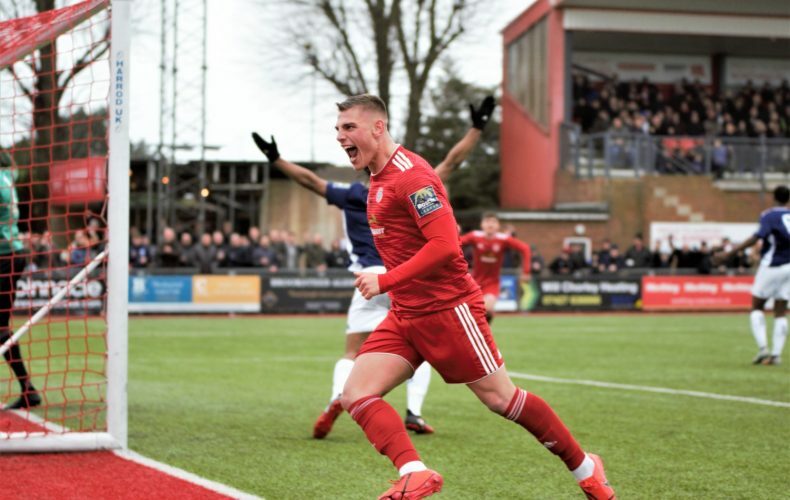 Roles reversed shortly afterwards, as firstly,Worthing’s top scorer came in from the right and Starkey’s shot on the turn was blocked by John-Paul Kissock. Then, just before the break, he created a shooting opportunity for Pearce, that the ten stabbed towards goal but it was comfortably cleared. The final say of the half derived from Duane Ofori-Acheampong’s good work to keep Pinney’s back header in play and beat Joel Colbran on the byline. His initial attempt was kept out by Young and despite some nifty footwork by Pinney, he could only find the safe hands of Covolan. Just like in the first forty-five, the the first real chance of the second period resulted in a goal. Pearce’s swinging left-sided delivery wasn’t properly cleared and Aguiar’s shot came off Goode to make Minter palm away. An offside-looking Kealy reacted quickest to gobble up the loose ball and tap home into an unguarded net. Hawks hit back through a lovely flick by Pinney dissecting Colbran and Aguiar, that left Captain, Henry Muggeridge sprinting clear, only for a heavy touch to allow Lucas to come and collect. Everyone’s favourite Brazilian then held a semi-acrobatic attempt by Ofori-Acheampong, from Rodrigues’ right wing cross. Neat approach play involving Kwame, Starkey and Kealy gave Aguiar a go from twenty yards, while his free-kick from way out on the left was nearly spooned into his own net by Minter, who recovered admirably to tip the ball over for a flag-kick. Hastings loanee, Sinn’Kaye Christie showed his defensive qualities in between times; by side-footing horribly wide when he found himself unmarked in the penalty area. A throw-in not enough to save his considerable blushes. Ambroisine could only head Aguiar’s delivery as far as Starkey, who allowed Kwame to try his luck on the edge of the area but he fizzed his effort over the framework. With ten minutes remaining, an Adubofour-Poku header gave Ajiboye room to send Starkey on the charge from fractionally inside the Hawks half. Unfortunately, his final attempt clipped the upright and went out for a goal-kick. Substitute, Connor Tighe briefly had hearts in mouths when he pounced an a rare slip by Ross Edwards and partially evaded the challenge of Colbran. However, it had been the right-back’s timely intervention that allowed his centre-half companion to concede a throw-in. A mini-scramble ensued upon the ball being returned to the danger zone, where Captain Colbran was on hand once more to deny both Ofori-Acheampong and, Tighe again, before referee, Graeme Ions, awarded a free-kick to our number two for a foul on him by the double-barrelled striker. It simply remained for Club Skipper, Darren Budd to have one last go at goal, just not get anywhere near it, after robbing fellow sub, Rob Deda in front of the home dugout.